The first time I had a canele was a few months ago at an event. The caterer had a limited supply, so he cut each tiny canele into 4-6 pieces. The bite of crispy, carmelized shell and custard flavored, moist interior had me hooked. So when I spotted these babies at Pozzo Bakery at San Want Hotel while picking up their garlic bread and walnut and cheese bread (their number one sellers for a good reason), I had to get a couple. The outside is rock hard and needs a knife to break in and the flavor is very sweet and addicting. 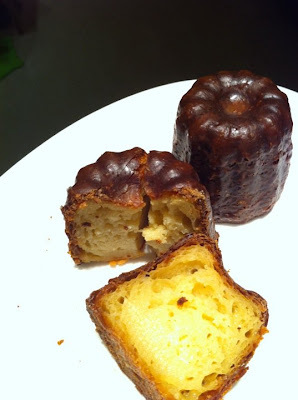 If you weren't familiar with a canele, you might think at first glance it's chocolate flavored because of the brown coloring, but there is none. It's almost echoes the eggy sweet flavors and textures of a perfect french toast- as a canele is made with egg yolks, sugar and milk, with touches of vanilla and rum. Pick up a couple an make your own afternoon tea or dinnertime dessert plate. There's something to be said about a place that has a half hour wait at 11pm. Granted, we were a large group of 10 people, but it's impressive that this two-floor hotpot place seems to be a hotspot for those wanting a late night meal. Shimin Da Dao Shua Shua Guo is on the corner of Civic Blvd (or Shimin Da Dao) and Yanji Street, with an electric blue neon sign highlighting its entrance (and weirdly, the other hotpot place across the street is nearly empty). Each person gets their own hotpot, a plate of veggies (with tofu, corn, mushrooms, fishcake and lots of cabbage) and a moment to look at the paper menu for meat options- the cheapest being choice pork at NT$280 to the most expensive-Kobe beef at NT$1880, or nearly US$60. There's also vegetarian and seafood options, like tilapia or scallop & prawns, as well as ala carte add on items (which is in Chinese only on the menu) like this make-your-own fish ball paste.. I decide on the prime pork (NT$320) which is tender enough, though I did enjoy the bite of my friend's boneless short rib. After ordering, the server will bring you the dipping soy sauce, which you can request to be spicy or not, as well as rice, vermicelli or noodles. My other friend ordered the snowy tender pork, and I didn't think it was considerably better than the prime pork even though it was more expensive. It was my first time having midnight hotpot and hopefully not my last... it's great to have good friends to drag out my homebody self and the meal isn't too heavy that you'll regret it the next morning. Complimentary sweet red bean soup to finish off the meal. As we leave, the place is still full (with a few tables with kids!) and the taxis line up outside to offer up rides to take us home. It's pretty insane that they are open until 5AM, but I guess you'll know where to go the next time a late night craving for kobe beef hits you. 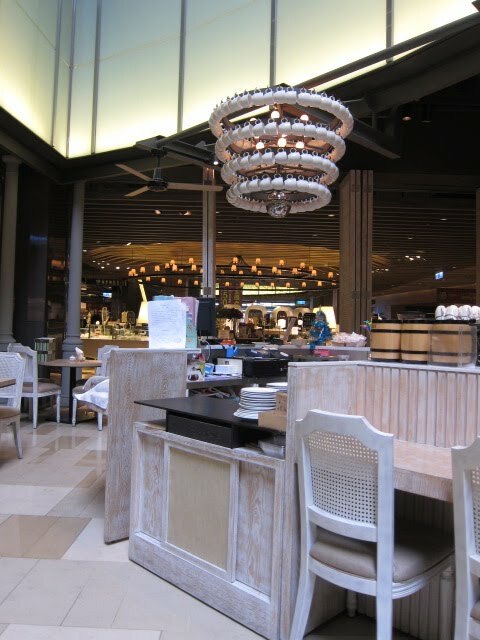 Shanghai Fans is a solid alternative to the nearby original location of the crazily popular Din Tai Fung, especially for those with large groups or families with three floors of seating and private rooms available upstairs. Like any good Chinese restaurant, it has a huge extensive menu barely covered by what was ordered in this dinner, but unfortunately, the menu is only in Chinese with few pictures, so you should bring a Chinese reader with you. The restaurant has that old school feeling and the prices are very reasonable for the family style portions. My aunt usually does all the ordering, and many of these dishes are featured on their "Top 10" dishes menu. That's usually my problem in taking so long to blog about Chinese restaurants- they don't have an English menu, someone else is ordering and I'm too busy chowing down to figure out what is what since everything tastes good. The Crab roe tofu pot has a creamy, sweet flavor along with the silky tofu. I love this over a bowl of rice. Make yourself a little pork belly sandwich with the sesame buns and braised Dongpo Pork. You can see the fat glistening off the pork belly and also on your lips when you're done devouring it. The pan fried spring onion pancakes here are fat and twisty, with the spring onions stuffed inside, which may turn off some who don't like the strong scallion texture and flavor. At Shanghai Fans, the xiao long bao is more of a side dish than the main event, but still satisfies. Those more adventurous can also try the si gua xiao long bao or loofah and shrimp. Huge pot of Corn and egg soup so everyone can have a bowl or two. Other dishes I've had before that I recommend ordering are the Shanghainese Pork Ham and Pork soup which has a milky white broth that beats any ramen broth I've had before, the cabbage and peanut slaw, and red bean paste in sesame pastry dessert. Or you can have a bowl of the sweet green mung bean soup. Chinese food is such ubiquitous thing in the US, but it's sort of stereotyped and simplified along the lines of dishes expected from a take-out menu- beef and broccoli, chow mein, egg rolls, kung pao chicken or even more Americanized, orange chicken (which I admit, I grew up on and like to eat sometimes). But in reality, Chinese food is so diverse and more than what's offered at Panda Express the same way that American food is more than what's sold at McD's. And there's so many great Chinese restaurants in Taipei that I've eaten at- it's been great having this blog to learn more about what is from where, and I'll try my best to keep figuring out the best way to capture and articulate and share my experiences here. Cookie brownies are for those with a serious sweet tooth, as the combination of the two is a bit over the top for me, even with a glass of milk. If you can't find this box and want to try it, just scoop spoonfuls of your favorite chocolate chip cookie dough onto your favorite brownie recipe and you can achieve the same effect. 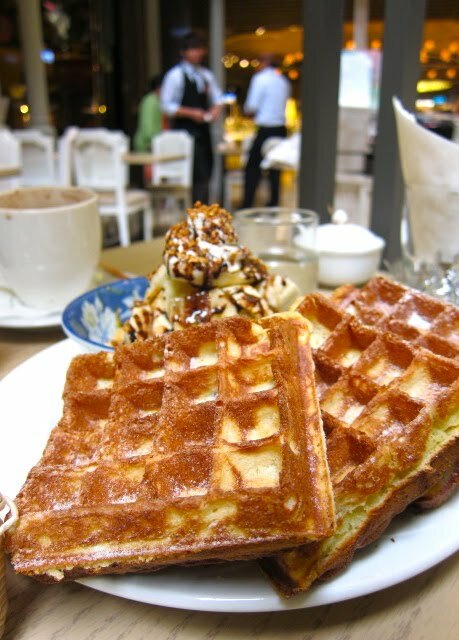 I have been on a search for a great waffle for brunch in Taipei ever since I've moved back- as I'm sure many of you have as well. The problems encountered in Taipei- too cakey, too dry, not crispy enough, available only for afternoon tea, too much hype, or too weird (with tuna?!). I think I finally might have found a contender that you fellow waffle lovers can try- and in one of the most random places, a cafe on the 2nd floor of the new-ish Q Square shopping center. 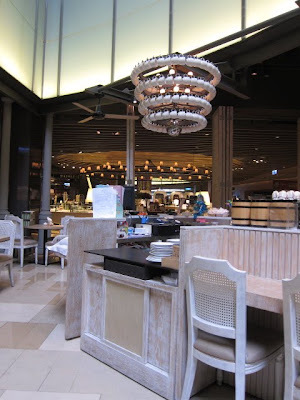 At first glance, I wasn't sure if I was at the right place, until I saw the sign above the kitchen which is across from the entrance/seating area which overlooks the lower floors of the mall. The airy space is a good place for people watching and has some interesting design, including the chandelier made out of coffee cups. I was afraid after seeing the waffles at the other table that they were going to be cakey, but when they finally arrived to my table, the banana chocolate waffles (NT$160) were lighter than they looked with a touch of crispiness and dusting of powdered sugar. I wasn't disappointed for once and could eat two of the huge slices. I was a little surprised that they served the bananas and sauce on the side, but nothing a little elbow grease couldn't fix. After digging in, I found a scoop of vanilla ice cream underneath the bananas. I was tempted to ask for extra sauce or syrup, but didn't- don't know if they would charge you if you did. Other waffle options on the menu include plain, strawberry, tuna or ice cream. Be forewarned that they have a policy on the menu, that one drink is required to be ordered per person sitting and the handmade coffees/teas/juices are NT$120-180, as well as a 90 minute time limit for seating, probably for those busy afternoon tea hours. The guy who seated us told us that my friend and i each had to order a drink, but when I couldn't decide, the second server said it was ok since I ordered waffles. When I went at noon, there were plenty of tables, but after I came back from lunch upstairs, the place was bustling at around 2:30pm. Our waffle took at least 10-15 minutes to come to our table, so I imagine the wait could be longer during busy hours. Other brunch/afternoon tea options on the English and Chinese menu are desserts cakes (on display in the entrance area), quiches, scones and chocolate molten cake. You can also check out their desserts at their patisserie in the food court on B3.